It’s week four of the One Room Challenge and a few things happened this week that are making this room start to feel like a real room. Still so much to do and feeling horribly behind though! We moved into the house officially this week and have spent the last four days hauling small loads of our personal items to the house in our SUV, and the furniture movers came yesterday to move the big stuff. We still have a few more small loads to bring over, and our furniture movers need to come back Thursday morning for a few more things that wouldn’t fit on the truck #hoarder. But Friday we’re closing and it’s gonna all be over from that end, so there IS a light at the end of the tunnel :) And I am so, so excited to spend some time this weekend doing more painting and getting the final details together! If you are just joining in, you can catch up on the previous weeks progress via the posts for Week One, Week Two, and Week Three. I have received a few inquiries about applying the lime wash. It is easy to apply with a wide, straight brush, moving in a bit of a cross-hatch pattern (or you can do up and down, depending on the effect you want). Portola Paints has a great video on their website showing the application, and I plan on doing a more detailed post on the product later this fall. As you can see, it goes one really dark and then lightens up as it dries. Even with just the first coat down it’s already looking soo soft and pretty! I love the way the light dances across this finish, it has so much depth. 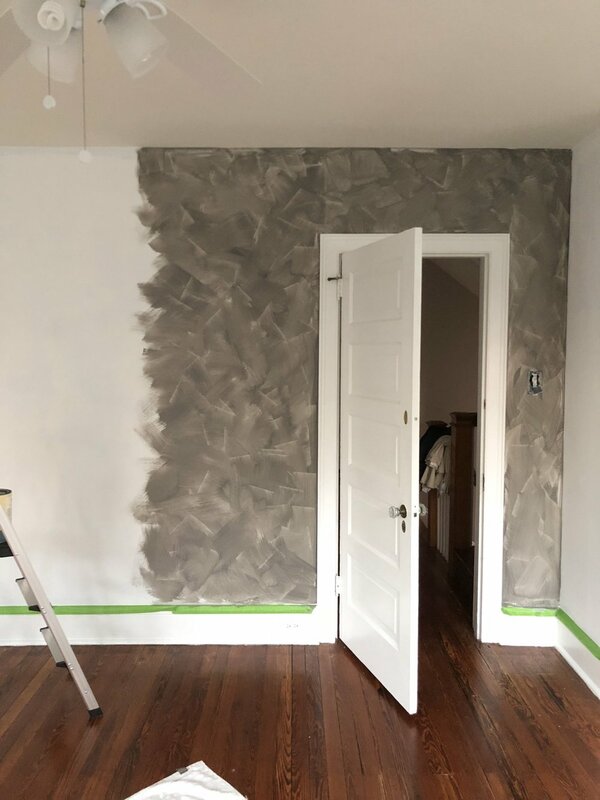 Now that we’re actually living at the house I’m hoping that stealing away for bits of progress on the painting will be a little easier instead of having to drive back and forth. Some special deliveries arrived this week as well! First off, a couple beautiful lighting pieces from Mitzi and Hudson Valley Lighting. I have used both these brands in several of my design projects prior to this and have found them to be stylish and well constructed. I chose a traditional pharmacy style lamp, the Girard Lamp for over in the seating area. For our dresser I chose a more modern lamp, the Piper Table Lamp which I fondly refer to as my “snowman” lamp to contrast the more traditional feel of our 1800’s dresser. Mitzi has such a great selection of modern meets traditional fixtures! Both pieces have a beautiful brass finish, which ties them together. They are heavy with all metal construction and anything that threads together feels nice and tight. I have come across my share of poorly produced lighting in years past and these two pieces feel solid, I will be able to have them in my home for years to come. The second very exciting addition to the room are the two Article Embrace chairs. I chose of soft moss green velvet and I am thrilled with how beautiful they look. The velvet reminds me of the hiking through our beautiful Fairmount Park here in Philly and seeing all the lush plant life and moss growing on huge rocks along the way. Having not been able to sit in them prior to ordering, I wasn’t sure how comfortable they would be but the curved arms and back fit you in all the right places and the seats are deep to keep you relaxed and big enough to curl your legs up into. The arms are a bit lower which will help give some nice flow to the sitting area and the curves also give them some softness. I am SO excited for some quiet coffee mornings in these chairs! One thing I really like about Article is that they offer a flat shipping fee of of $49 (or $19 for small shipments) for most orders, no matter how large. AND Article offers a 30-day satisfaction guarantee so you can try out your new furniture in your home. If you’re not completely happy, they’ll pick up the furniture and provide a refund, minus the delivery and pickup charges which is $49 in most cases. Seems like low-risk way to try out some great pieces, especially if you don’t have a ton of time to peruse furniture stores. Alright friends, that’s it for now! Stay tuned for some fun progress on the headboard, finishing up on painting and more fun details coming in like lighting, rugs, and artwork. I’ll be giving lots of behind the scenes in my Instagram Stories if you aren’t already following along. And thank you all for your heartfelt comments and cheering me on to the finish line, it means so much to me! Be sure to check out what all the other featured designers are planning for their spaces by following the links below. And check out the guest participants too, there is so much talent and creative inspiration to be seen! We're honored to have been featured in the December/January Issue of American Craft magazine alongside several other talented artisans and designers. You can read more from the issue here.